Customer experience research can feel like a logic question on the SATs: “Pick which fish does not belong in this series (that we designed).” The question completely misses the opportunity for a customer to write in a new type of fish—or perhaps a bird, if they feel that it might better solve the problem. This type of ‘outside-in’ research is designed only to confirm internal ideas. If this is your approach to CX, you may be missing important opportunities to connect with and engage your customers. In this post, we’ll explore a more customer-first approach and how to apply it to your next research project. You will learn to start with a flexible research plan that gradually builds on inputs from customers and stakeholders and you’ll discover new co-creation opportunities that expand the utility of your insights. In activating your customer feedback, you’ll realize its full potential in producing business results (even if it means killing an idea the team loves). 1. A research plan is not a finalized output. A research plan is not a deliverable; it’s a messy process. Each step (and associated methodology) within a research plan incorporates inputs from the last step of discovery with customers, SMEs and stakeholders. If you want to ensure a research project will have the opportunity to impact rather than being exiled to a desktop drawer, start by unpacking where the company is and what the company is trying to accomplish. This conversation should include key stakeholders and will help define your initial ‘learning goals’ for your project. What are our business goals? What are our research goals? What existing research and knowledge can we use or build upon? Try not to get so excited that you shift straight into an ideation session filled with thousands of multi-colored sticky notes. Take some time to understand your customer. Before you schedule interviews, try the entire process end-to-end yourself. Depending on your research focus, this may include processes like signing up for a new account, applying for a loan, or buying a product. Draw the steps of the process on a whiteboard. Set a timer for five minutes for each ‘step’ and come up with as many questions as possible. Prioritize questions that prompt conversation. 2. Look for co-creation opportunities, not just confirmation. When you conduct your interviews, learn to embrace rabbit trails. A flexible interview approach can lead to customer-designed products instead of company-centric ones. This way you also get more insightful feedback from your target market long before you have invested in a prototype and minimum viable product. Empower your participants by using a co-creation technique. If a customer has an idea during an interview, give them a pen to draw it. Give them a pain point (or series of pain points) and challenge them to imagine a better experience. If a participant needs more inspiration, give them additional exercises with frameworks to imagine further: what could this step look like in thirty years, what brand could they ‘borrow’ a customer experience from to help solve the challenge? 1. Who should you talk to? 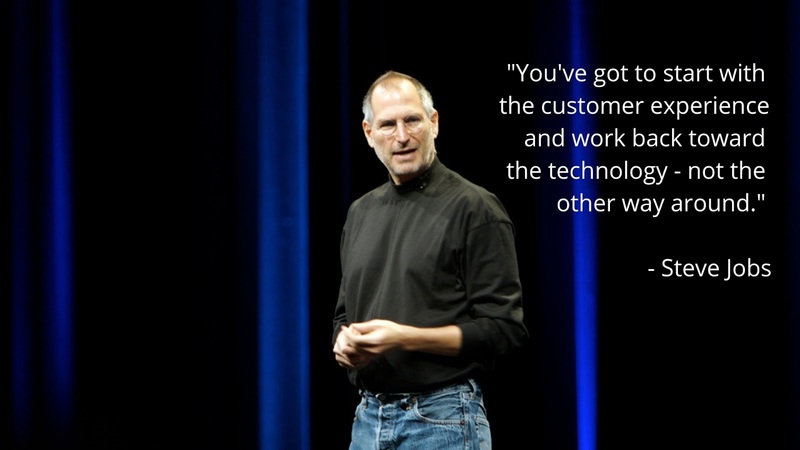 Who will be using the product or service? ‘Customers’ are traditionally those who buy/consume/use the product and they are also the employees who provide the product/service. 2. What should you talk to them about? Think about the various steps in the process of using the product or service and the needs specific customers may have at different steps. Then, recall the pain points you experienced when you tried the product or service and imagine a few raw concepts that could help solve them. 3. How many times are you talking to them and what artifacts are you using to inspire co-creation? Decide if you are cultivating relationships with a specific customer or if you will have conversations with various customers along the design journey and craft your questions accordingly. Decide what artifacts (worksheets, concept vignettes, card sort deck, etc.) you need to bring to prompt ideation. 3. Accept that your baby might be ugly. Sometimes it isn’t your idea; it may be your co-worker’s, clients’ or the CEO’s. As researchers, we have to toughen our skin to prepare for critical feedback from our customers. Remind yourself that you are doing this research to get this feedback— to inform the design for the product or process. If a customer or constituent does not have a single adaptation for your creative concepts, you have either created the most perfect idea in the world or (more likely) you have not invited them to ‘edit’ the concepts. Try to supply each individual customer or stakeholder with the information and inspiration they need to iterate without leading them in a certain direction. Here are a few questions adapted from the SCAMPER design method to keep in mind when you are encouraging customers to edit concepts and products that you put in front of them during an interview. Would you combine or rearrange any parts? Would you take anything away or add to it? Would you put something to another use elsewhere? For your next project, start and end your research with customers. Plan your research with the flexibility to change based on customer inputs. Inspire customers to co-create solutions with you and actually consider their feedback when you design. After all, customers are the ones buying the products and using the services and they love products and services they feel are designed for them, not a company’s revenue stream. Looking for help with strategy, implementation, or end-to-end support? Get in touch with Skookum and see how we can help.